Considering the pharmaceutical importance of hydantoins, a set of 25 derivatives of phenytoin, nirvanol and 5-methyl-5-phenylhydantoin, the lipophilicities of which were gradually increased by the introduction of different alkyl, cycloalkyl and alkenyl groups in position N3, was synthesized. Their properties under consideration were either estimated empirically, by UV/Vis spectroscopy, or calculated using established medicinal chemistry software. The UV absorption spectra of the investigated compounds were recorded in the region from 200 to 400 nm, in selected solvents of different polarities. The effects of solvent dipolarity/polarizability and solvent-solute hydrogen bonding interactions were analyzed by means of the linear solvation energy relationship (LSER) concept proposed by Kamlet and Taft. Furthermore, the relationships between solvent-solute interactions and selected structural features of the solutes, which are believed to markedly affect the processes of absorption, distribution, metabolism, excretion and toxicity (ADMETox), were discussed. Satisfactory correlations were found between hydrogen bonding properties and solute size and the in silico calculated bioactivity descriptors, in particular %Abs. (human intestinal absorption), log BB (blood-brain barrier permeation) and log kA (protein binding affinities) parameters. In view of the results of this study, the investigated hydantoin derivatives met the pharmacokinetic criteria for pre-selection as drug candidates and qualified them for the pharmacodynamic phase of antiepileptic drug development. Derivatives of hydantoin (imidazolidine-2,4-dione) have been demonstrated to exert various effects on nervous systems, most of which are compatible with an anticonvulsant action. Phenytoin (5,5-diphenylhydantoin, Dilantin®) is one of the oldest non-sedative antiepileptic drugs, which is employed in cases of generalized tonic-clonic seizures (so-called grand mal epilepsy) and focal motor seizures . Mephenytoin (3-methyl-5-ethyl-5-phenylhydantoin, Mesantoin®) has the same spectrum of indications as phenytoin, but its use is limited to the cases unable to tolerate other drugs . Thus, the demethylated metabolite, nirvanol (5-ethyl-5-phenylhydantoin), was the first hydantoin derivative introduced for the treatment of chorea . Due to numerous side effects, its use was soon abandoned. Ethotoin (3-ethyl-5-phenylhydantoin, Peganone®) has a lower anticonvulsant potency than phenytoin and additional hypnotic effects, which limit its clinical use . The anticonvulsant action of hydantoin derivatives is due to the selective block of high-frequency neuronal activity [5, 6]. The molecular mechanism for this is their binding to the voltage-sensitive sodium channels responsible for the action potential. Phenytoin is suggested to form an array of molecules stacked on a β-turn segment of the proteic part of the putative receptor site, through the formation of hydrogen bonds with the carbonyl group in position 2 and the NH group in position 3 . However, this site on the voltage-sensitive sodium channel is still not completely defined. Compounds with increased selectivity for it may provide significant activity and fewer side effects. Regarding the structural demands, Poupaert et al. observed that the anticonvulsant activity was decreased when the hydrogen bond formation ability of the phenytoin molecule was reduced by altering the hydantoin ring into succinimide and pyrrolidinone and when these rings were N-methylated. This study was expanded by Cortes et al. , who observed loss of activity on changing the hydantoin ring to imidazolone or imidazolidinone, by modifying the hydrogen bonding groups. On the other hand, Roszak and Weaver  summarized that the hydantoin ring structure can be split into two fragments, one responsible for the anticonvulsant activity (N3-C4(=O)-C5) and the other for mutagenic effects (-C2(=O)-N3(H)). A proper structural modification can enable the differentiation of efficacy from side effects. In general, SAR studies of anticonvulsants revealed the need for the retention of at least one hydrophobic site and hydrogen bond donors/acceptors, in certain relative orientations, for activity to be exhibited. where E is the excess molar refraction, S is the dipolarity/polarizability, A is the overall hydrogen bonding acidity, B is the overall hydrogen bonding basicity, V is the McGowan characteristic molar volume. Evidently, solute dipolarity/polarizability and, especially, solute hydrogen bond basicity favor water, while solute size favors n-octanol. This implies that water is more dipolar and is a stronger hydrogen bond acid than n-octanol. The minor contribution of the solute hydrogen bond basicity to the partitioning reflects a small difference in the hydrogen bond acidities between these two solvents. Structures of the investigated 3,5-disubstituted-5-phenylhydantoins. where π* is an index of the solvent dipolarity/polarizability; β is a measure of the solvent hydrogen bonding acceptor (HBA) basicity; α is a measure of the solvent hydrogen bonding donor (HBD) acidity and ν0 is the regression value of this solvent property in cyclohexane as reference solvent . The regression coefficients s, b and a in Eq. (2) measure the relative susceptibilities of the absorption frequencies to the indicated solvent parameters. This treatment of solvation effects assumes attractive solute-solvent interactions and enables the ability of the investigated compounds to interact with surrounding media to be estimated. Due to this, Eq. (2) served for deriving data for the further QSPR studies. In previous papers, a set of eight 3-substituted-5,5-diphenylhydantoins  and a set of nine phenytoin-like anticonvulsant drugs  were assembled to analyze the structural determinants governing the partitioning of the solute between n-octanol and water. It was demonstrated that log P correlates well with the ratio of the contributions of specific solvent-solute interactions in the former case, and with the ratio of the relative contributions of specific and nonspecific interactions in the latter. Here, the same methodology was applied to establish the relationships between solvent-solute interactions, determined empirically, and the ADMETox end points of a larger number of the hydantoin derivatives, obtained by established computational medicinal chemistry methods. 5,5-Diphenylhydantoin was commercially obtained (Fluka), while 5-ethyl-5-phenylhydantoin and 5-methyl-5-phenylhydantoin were synthesized by a modification of the method of Bucherer and Lieb . The appropriate ketone was heated with (NH4)2CO3 and KCN in 50% ethanol (Figure 2a). The obtained compounds were alkylated at the N3 position using the corresponding alkyl halide in K2CO3/N,N-dimethylformamide to obtain compounds 1-7 and 11-25 (Figure 2b) . 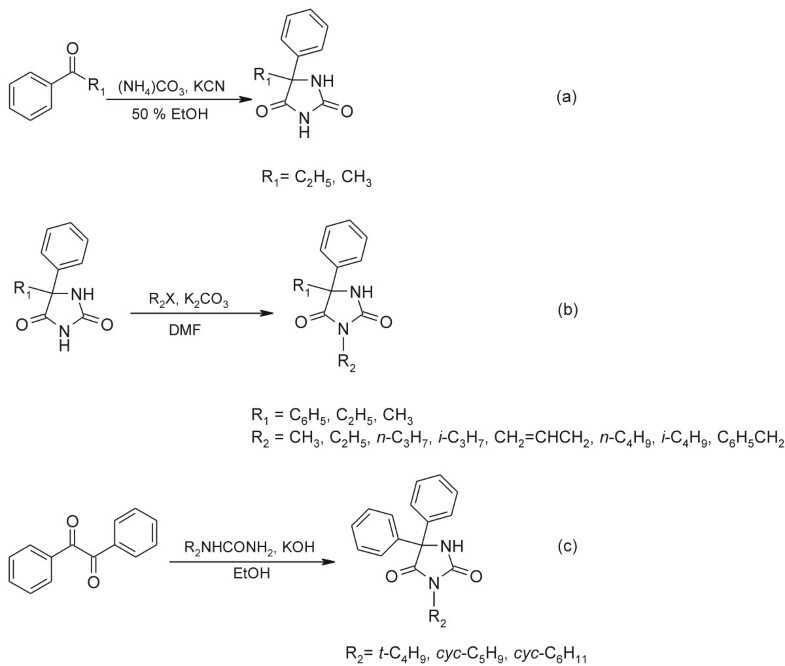 When the reaction with alkyl halogenide did not occur due to a change in the reaction pathway or gave a low yield, the derivatives (8-10) were obtained by the Biltz reaction from benzil, respectively urea, and KOH in ethanol (Figure 2c) . The chemical structures and the purities of the synthesized 3,5-disubstituted-5-phenylhydantoins were confirmed by their melting points, and FT-IR, 1H and 13C NMR spectra [Additional file 1]. Preparation of the investigated 3,5-disubstituted-5-phenylhydantoins. The 1H and 13C NMR spectral measurements were performed on a Bruker AC 250 spectrometer at 200 MHz for the 1H NMR and 50 MHz for the 13C NMR spectra or on a Bruker 300 spectrometer at 300 MHz for the 1H NMR and 75 MHz for the 13C NMR spectra. The spectra were recorded at room temperature in DMSO-d6. The chemical shifts are expressed in ppm values referred to TMS (δH = 0 ppm) in the 1H NMR spectra, and the residual solvent signal (δC = 39.5 ppm) in 13C NMR spectra. The FT-IR spectra were recorded on a Bomem MB 100 spectrophotometer. The UV absorption spectra were measured with a Shimadzu 1700 spectrophotometer. The UV spectra were taken in spectro quality solvents (Fluka) at a fixed concentration of 10-5 mol/L. All solvents were of the highest available grade and spectral purities and used without further purification The reported values of νmax are average from three measurements of the corresponding λmax. As expected, no significant differences between repeated measurements were observed and their uncertanity was considered to be negligible When broad bands appear (e.g., c, e and f in Figure 3), high order polynomial curves (n = 9) were fitted to the data by using Origin 8 and the absorption maxima were determined on the basis of the first derivative of the fitted curves. The UV spectra of compounds 1 (a), 13 (b) and 20 (c) in methanol and 1 (d), 13 (e) and 20 (f) in 2-methyl propan-2-ol. The correlation analysis was realized using Microsoft Office Excel 2003, which considers the 95% confidence level. The goodness of fit is discussed using the correlation coefficient (R), standard deviation (sd) and Fisher's criterion (F). In the absence of the appropriate experimental data in the literature, computer methods are used do predict ADMETox-related properties of investigated compounds. Their lipophilicities were estimated by calculation of log P values with the Advanced Chemistry Development (ACD) Software Solaris v. 4.67. The human intestinal absorption (%Abs.) and the percentage plasma protein data (fb) are obtained by the ChemSilico program (http://chemsilico.com). The corresponding physicochemical parameters and the activity data of the studied compounds are collected in Table 1.
acalculated by ACD Solaris v. 4.67.
bhuman intestinal absorption data (%Abs. ), the blood-brain permeation (log BB) and percentage plasma protein binding (fb) were calculated by ChemSilico. cprotein binding affinities were obtained using Eq. 6.
dsum of the values of the Taft steric parameters of R1and R2. esum of the values of the Taft electronic parameters of R1and R2. The absorption spectra of all molecules were characterized by one band with a weak low-energy shoulder appearing in some cases (Figure 3). This is typical for 5-phenylhydantoin derivatives. In our previous paper , the photophysical facet of the UV absorption of 5-substituted-5-phenylhydantoins was discussed on the basis of the observed and the ab initio calculated absorption spectra in various solvents. The fundamental study of this chromophoric system indicated that the main absorption can be considered to result mainly from an intramolecular charge transfer corresponding to a migration of electron density from the hydantoin moiety to the phenyl ring. The absorbance frequencies of the investigated compounds in fifteen solvents are collected in Table 2. As was expected, the absorbance maxima shifted in solvents of different polarities. Solvent dipolarity/polarizability and hydrogen bonding are the principal factors in controlling pathways of energy dissipation following the electronic excitation. Their individual contributions are quantified by means of the LSER concept using Eq. (2). The solvent parameters are shown in the Table 3[16, 23]. The correlation of the spectroscopic data was carried out in terms of multiple linear regressions. On the basis of high values of the multiple correlation coefficients and the Fisher criterion, the correlation results of the absorption frequencies of studied molecules in the selected solvent set with the π*, β and α parameters can be considered as satisfactory. The regression values νo, s, b and a fit at the 95% confidence level are presented together with the corresponding standard errors in Table 4. The general effectiveness of the quantification and interpretation of solvent effects on the shifts of the absorption maxima of the investigated molecules is presented in Figure 4 by means of a plot of νexp versus νcalc (R = 0.989). It can be seen that the Kamlet-Taft equation describes better the experimental data for HBA solvents than for HBD solvents. The largest, but still acceptable discrepancies were obtained for aliphatic alcohols with bulky alkyl groups (butan-1-ol, butan-2-ol, 2-methyl propan-2-ol). This might be ascribed to steric interactions which the Kamlet-Taft equation does not take into account. The similar situations were reported in the literature [24, 25]. However, this was afterwards overcome by inclusion of the Taft steric parameter in the analysis of structural effects on ADMETox properties of the molecules investigated in this work. A comparison between the experimental (ν exp ) and the calculated absorption frequencies (ν calc ). The open points present data for the following alcohols: butan-1-ol, butan-2-ol and 2-methyl propan-2-ol. The red shift of the absorption bands with increasing solvent dipolarity/polarizability (s < 0) indicates a higher dipol moment of the excited state compared with the ground state. This behaviour is in fact typical for intramolecular charge transfer processes. The hydantoin moiety plays the determining role in the specific solvent-solute interactions. 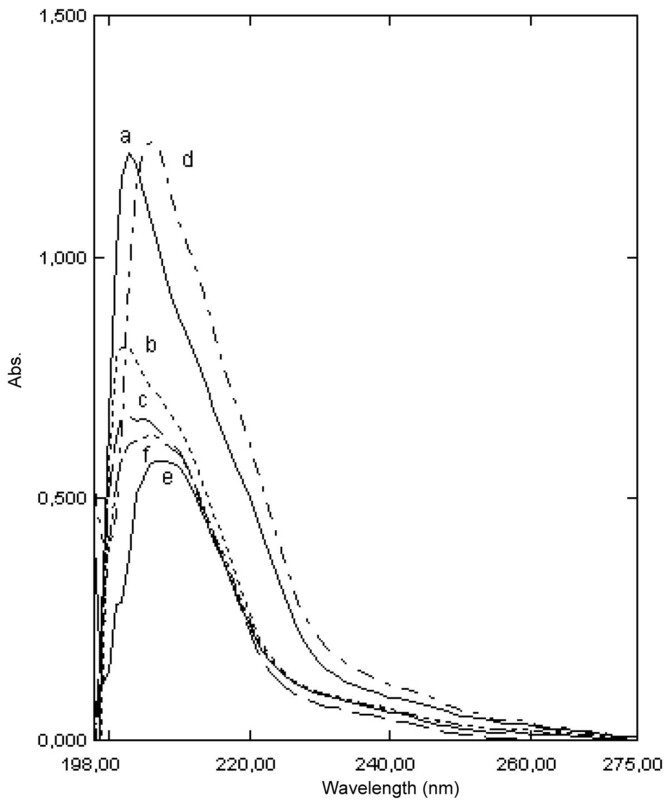 The absorption maxima underwent a hypsochromic shift with increasing solvent HBD capacity (a > 0). This results from hydrogen bond formation of protic solvents with the oxygene lone pairs of the hydantoin carbonyl groups, making their excitation more difficult. Thus, this implies the stabilization of the ground state relative to the excited state. In contrast, the HBA properties of the solvents, represented by the b coefficient, have a smaller effect. Hydantoins are weak acids dissociating at the imidic NH group in position 3, because this allows a more efficient delocalization of the negative charge than ionization at N1. The evidence for the very weak acidic character of the latter position comes from the fact that 3-substituted hydantoins demonstrate no appreciable ionization , but the introduction of an electron-withdrawing group at position C5 increases the acidity of the N1 hydrogen, making it measurable . Hence, the electron release due to hydrogen bonding of the NH group with HBA solvents lower the energy of the excited state causing the absorption maxima to shift to the red (b < 0). Therefore, the stabilization of the excited state relative to the ground state occurs. Since the π*, α and β parameters are roughly normalized to cover a range from 0 to 1 , it is accepted that the a/b, a/s and b/s ratios provide a convenient measures of the relative contributions of the indicated types of solvent-solute interactions to the absorption maxima shift . As can be seen from Table 5 (the corresponding propagated errors are included), the solvatochromic properties of the investigated compounds result mostly from specific solute-solvent interactions rather than from nonspecific ones. These results are in accordance with their preferred existence as the imido tautomer in solution. Based on the estimated abilities of the compounds to interact with their environment, the relationship between specific interactions and the selected structural properties, which are related to ADMETox parameters, were investigated. Regioselective protection of the hydantoin ring is important for the optimal sodium channel binding. Smithies suggested that the strong hydrophobic shield produced by the phenyl groups of the phenytoin molecule protects the hydrogen bonds, formed by the imidic part of the hydantoin ring and a β-bend protein segment from water extrusion . Due to this, further parameters concerned with the solute size are additionally required for an adequate description of the structural features of molecules in such homologous series. The lipophilicities of the investigated hydantoins were estimated by calculation of log P values with Advanced Chemistry Development (ACD) Software Solaris v. 4.67 (Table 1). The log P value is a solvational characteristic, since it is directly related to the change in the Gibbs energy of solvation of a solute between n-octanol and water. The calculated values of log P were plotted against the regression coefficient a from Eq. (2), as a measure of the importance of a solute to accept a hydrogen bond, revealing two linear relationships (Figure 5), mainly due to the different structural characteristics of the substituent R1. 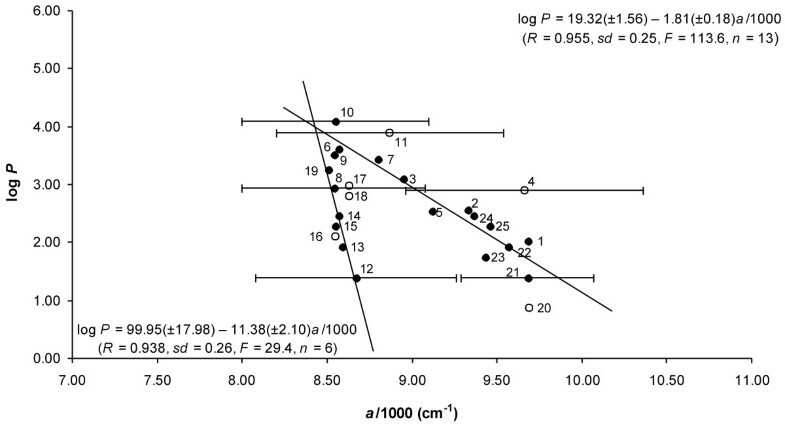 Correlation between the log P values and the regression coefficient a derived from Eq. ( 2 ). The presented error bars correspond to standard errors of 4, 8, 10, 11, 12 and 21 (Table 4). A satisfactory correlation of log P with a is achieved through the additional inclusion of the sum of the Taft Es values of the substituents R1 and R2 , which is presented by Eq. (3). Compounds 8, 19 and 24 are outliers from Eq. (3) for statistical reasons, but they have no significant effect on the modeling made for the investigated set of compounds. 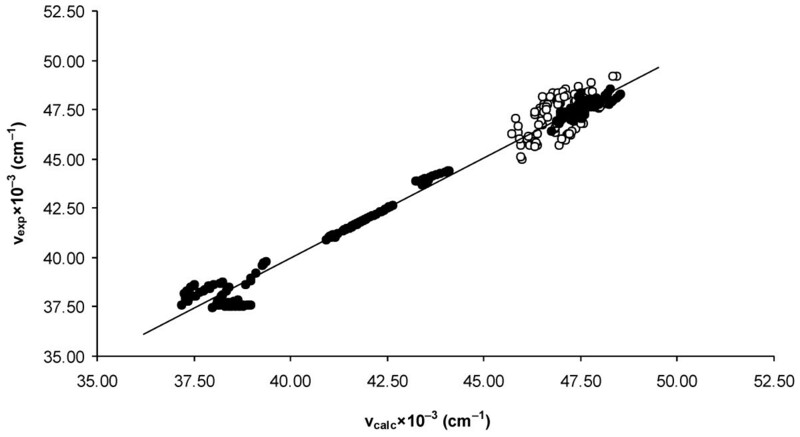 The obtained correlation corresponds well to the Abraham characterization of the n-octanol-water partitioning system . As was stated, water is a stronger hydrogen bond acid than n-octanol and hydrogen bond basic solutes interact weakly with the latter solvent. Solute size leads to an increase in log P, as expected, due to the larger energy required to create a bigger cavity in water and the greater dispersion force interactions with solutes in n-octanol. Different relationships have been established between log P and absorption or permeability in intestinal models [30, 31], blood-brain barrier models  and cell-culture models [33, 34], to name just a few. Here, the a coefficient from Eq. (2) was used to model the human intestinal absorption (HIA) data of the investigated hydantoin derivatives, obtained with ChemSilico. The HIA values (%Abs.) are expressed as the percentage of a compound absorbed by the intestine (Table 1). 3,5-Disubstituted-5-phenylhydantoins, with an HIA greater than 90%, can be classified as well absorbed. A satisfactory correlation of the %Abs. data with a and ΣEs (Eq. (4)), obtained for 23 compounds, reveals that the hydrogen bond basicity and solute size are important for absorption. A possible reason for the outliers 12 and 20 is that some additional factors might contribute to the absorption of the hydantoin derivatives bearing small hydrophobic substituents. In general, this is in agreement with work of Abraham, who suggested that hydrogen bond properties are dominant in governing the HIA [35, 36]. However, it should be borne in mind that the absorption of the investigated compounds may not only be controlled by the passive diffusion rate, but also by the in vivo dissolution rate in the small intestinal fluid. In the search for drugs targeted at CNS diseases, the ideal candidates must be able to effectively penetrate the blood-brain barrier (BBB). For anticonvulsant assays, the optimal lipophilicity for the penetration through the BBB appears to exist at about log P = 2 [37, 38]. The relative affinities for the blood or brain tissue can be expressed in terms of the blood-brain partition coefficient, log BB = log (Cbrain/Cblood), where Cbrain and Cblood are the equilibrium concentrations of a drug in the brain and blood, respectively. Based on data from the ChemSilico program, all compounds have a high chance of entering the brain because their log BB values are greater than -0.3 (Table 1). Modeling of the BBB penetration has been the subject of many studies [39–41]. Here, the relationship between the brain-blood concentration ratio with a and ΣEs implies that the properties concerned with molecular size and hydrogen bond formation are important contributors to log BB. The outliers removed to obtain Eq. (5) are compounds 10, 11 and 19 bearing a large hydrophobic substituent at position 3. It might be expected that compounds with such a structural feature would fill the hydrophobic region of the receptor and thereafter their activities would decrease due to steric hindrance during the steric interaction of the ligand and receptor. As mentioned previously, the therapeutical usefulness of hydantoin-based anticonvulsants is limited owning to their inherent toxicity. Additional evidence for solvation effects on the structure-activity relationship of the investigated compounds was obtained by the correlation of the calculated protein binding affinities (kA) values with the a coefficient. It was shown that the toxic effects of phenytoin correlate best with the level of the free drug in plasma . Protein binding values (fb, fraction bound) are given as the percentage of the total plasma concentration of a drug that is bound to all plasma proteins (Table 1). Human serum albumin (HSA), the most abundant protein in blood plasma (concentration 0.53-0.75 mM), has multiple hydrophobic binding sites and binds a diverse set of drugs . The percentage data were converted into an equivalent binding affinity kA with the following formula (Eq. (6)) derived from the law of mass action. kA is the binding affinity to HSA under the assumption that binding occurs exclusively to HSA, a binary complex is formed and an excess of albumin (concentration 0.6 mmol/L, [HSA]) is present compared to the concentration of the drug . Based on the data from Table 1, the binding of drugs to serum albumin can generally be explained by hydrophobic interactions within such homologous series. However, the correlation between the log kA values and a, enhanced through the use of Σσ* and ΣEs as additional parameters  (Eq. (7)), implies that the binding of all the investigated compounds to albumin depends on specific molecular recognition, such as directed hydrogen bonds, charge interactions and space filling of binding pockets. Evidentially, bulky electron-withdrawing substituents attached to the hydantoin ring are needed to achieve a relatively high level of protein binding. As a result of this, derivatives of phenytoin are expected to be the least toxic hydantoin-based anticonvulsants. As a preliminary investigation of the interactions of potential anticonvulsant drugs, a set of 25 derivatives of phenytoin, nirvanol and 5-methyl-5-phenylhydantoin, the lipophilicities of which were gradually increased by the introduction of different substituents in position N3, was synthesized. The satisfactory correlation of their UV absorption frequencies with the Kamlet-Taft solvatochromic equation indicated that the selected model interpreted correctly the linear solvation energy relationship for the complex hydantoin system in the employed solvents. The LSER method enabled the overall solvent effects to be quantitatively estimated and separated into specific and nonspecific contributions. The solvatochromic behavior of the investigated compounds was related to their pharmacologically relevant properties. Accompanying calculations of log P and various pharmacokinetic data (human intestinal absorption, blood-brain barrier permeation and protein binding affinities) were performed and correlated with the spectroscopically-derived hydrogen bond accepting abilities. The obtained models additionally represented how the electronic and steric effects of substituents attached to the hydantoin ring determine biological partitioning and interactions of the compounds with target sites. Moreover, their good agreement with the regression models of Abraham was demonstrated for the contributions of hydrogen bond basicity and molecular size. The approach proposed in this work could be applied to optimize ADMETox properties of compounds with potential for pharmacological application. This work was performed within the framework of the research project No. ON 172013, supported by the Ministry of Science and Technological Development of the Republic of Serbia. NT carried out the synthesis and characterization of the compounds. NV performed the calculations of molecular descriptors and the statistical analysis. GU conceived of the study and participated in its design and coordination. All authors read and approved the final manuscript.